If your business sells to customers on credit, you will generate invoices and have accounts receivable representing amounts due from your customers. The problem with this is that there is a delay between incurring costs (labor, materials etc.) to manufacture the product, and receiving the cash from customers to pay for those costs. This delay or funding gap due to the credit period given to customers, can cause significant cash flow issues particularly when a business is expanding, and the amount of credit given increases. Invoice factoring is one method used to try and solve this problem by allowing businesses to raise short term finance by selling its accounts receivables (outstanding customer invoices) to a factoring company. The advantage of factoring accounts receivables is that as the business grows, the accounts receivables grows, and therefore the availability of short term finance grows with the business, avoiding among other things the risk of overtrading. Invoice factoring effectively means that the business sells its outstanding customer invoices to a factoring company in return for cash. The invoice factoring company is then responsible for collecting the accounts receivable. The factoring company charges the business a fee usually based on the value of the invoices factored, the risks involved, and the level of cash advances made until the factoring company has collected the cash from the customer. Business sells to customers on credit and generate invoices and accounts receivable. Accounts receivable are sold to the invoice factoring company. Factoring company provides the business with a cash advance. 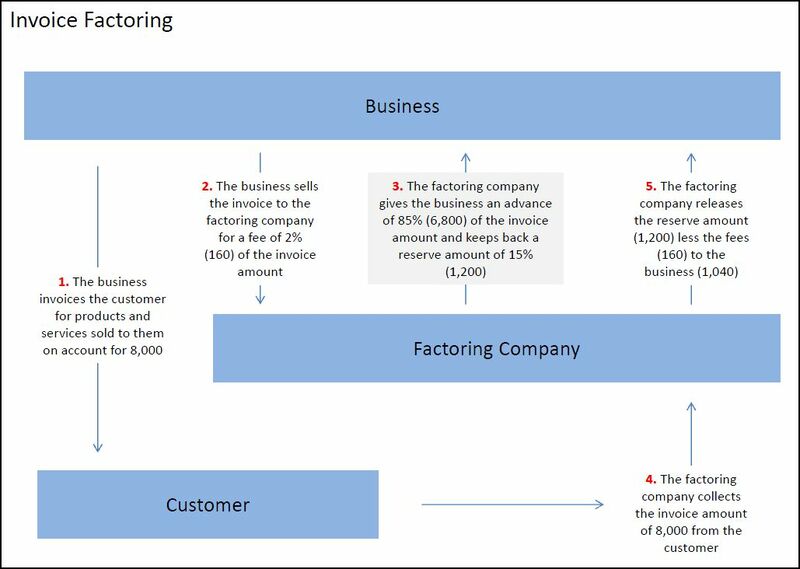 Factoring company collects the accounts receivable from the customer. Factoring company pays the business the balance of the accounts receivable less fees. As an example, suppose your business has manufactured a product and has made a sale to a customer on 60 day credit terms, which normally means that the business would have to wait 60 days before receiving payment. In the meantime, it has had to pay for labor and materials used in the manufacture of the product, and has to find this finance either from supplier credit, equity, or additional borrowings. However, if the business uses invoice factoring, it would immediately sell the invoice to the factoring company for a fee and receive in return an initial advance of between 65% and 85% of the invoice value allowing it to fund its costs. The invoice factoring company would then collect the full outstanding amount from the customer, and pay the business the remaining balance of the invoice value less any fees it charges. In practice an invoice factoring company will approve batches of invoices at the same time and make the advance based on the total amount outstanding from customers. Invoice factoring is particularly relevant to a high growth, start up business as it allows short term funding to grow as the business itself grows, helping to avoid some of the risks of overtrading. The level of finance available from factoring receivables (65% – 85% of invoice value), tends to be significantly higher than that provided by a bank loan, which typically values accounts receivable at 50% of their face value. In addition, invoice factoring also provides the administration of accounts receivable collection facilities, and bad debt protection. Despite these advantages, invoice factoring is regarded as an expensive form of finance, as the fees and interest on cash advances can be substantial. For that reason it is not seen as a sustainable long term approach to funding, and is more suited to high growth situations where working capital requirements increase rapidly and cash is in short supply. In addition, unfortunately, invoice factoring it is often viewed as indicating that a business has cash flow problems. Invoice factoring is viewed as the sale of accounts receivable (outstanding invoices) with payment in two installments, an initial immediate cash advance followed by a payment of the remaining balance less fees when the accounts receivable has been collected. The effect of this transaction is to reduce the accounts receivable, and increase cash on the balance sheet and to add factoring fees as an expense to the income statement. One way to deal with this in the financial projections template is to reduce the value of the days sales outstanding. For example, if without factoring, the normal days sales outstanding is 60 days, then the accounts receivable would be calculated by the financial projections template as being equal to 60 x (Annual sales / 365). However, if the business factors for a 2% fee and receives 85% in advance, leaving at any one time 13% outstanding from the factoring company, then on average the days sales outstanding would be 60 days x 13% = 8 days. Setting the days sales outstanding to 8 days will reduce the balance on accounts receivable (which is now due from the invoice factoring company not the customer), reduce the amount needed to fund working capital in the cash flow, and automatically increase the cash in the balance sheet, giving the effect of accounts receivable factoring. The only other matter to allow for is the increase in general and administrative expenses by an amount equal to 2% of the credit sales to reflect the invoice factoring fee. Invoice factoring refers to the process of selling accounts receivable (outstanding invoices) in return for a initial cash advance followed by a second payment representing the remaining invoice balance less fees. As the accounts receivable are sold, the risks and benefits pass to the factoring company, and they are no longer as asset of the business. The accounts receivable balance is reduced and the cash balance increases, there is no loan created in the business. The alternative to this is the assignment of accounts receivable. In this case, the accounts receivable are not sold, they are assigned to the finance company, who are given the right to the cash collected from specific accounts receivable. The accounts receivable remain as an asset of the business, and the cash advance provided is treated as a loan from the finance company. In effect, the accounts receivable have been used as collateral for a loan. *In the UK the term invoice discounting is also used and is regarded as a form of factoring. The invoice discounting process is very similar to invoice factoring except that with invoice discounting the business itself is still responsible for collecting the outstanding invoices from the customer, and the process can remain confidential between the business and the invoice factoring company without the customer ever knowing the arrangement has taken place. Invoice discounting is more suitable for larger businesses with established credit control systems and processes.